Opossums are nocturnal pest animals and mostly live in North America. An opossum is marsupial which means the female gives birth to young ones who grow in a pouch. Opossums are known for their opposable thumbs, 50 teeth (more than any other mammal) and prehensile tails that they use to hang or grip from objects, although they rarely do. They are not normally dangerous animals and rarely attack people unless they feel threatened. However, if they are truly terrified, they may just play ‘opossum’ and pretend to be dead, tongue lolling out and all of the other dramatic effects. When it comes to intelligence, opossums drew the short straw. They are not very intelligent creatures, but they still know how to cause serious havoc to your home and lifestyle. They are very destructive and noisy and love to leave their smelly messes in your attack. They will tear up the wood, wires and other areas of your home as they scrounge around for food supplies. Because of their low body temperature, opossums do not carry rabies. However; they do breed tics and fleas that carry other diseases, especially in their waste that will coat your attic, walls, basement and other areas of your home. Their waste also carries roundworms and the fleas in their fur can carry murine typhus. Opossums are nuisance animals and it becomes uncomfortable living with them under the same roof. You will hear scratching noises, mating sounds and fighting and crying of their babies especially at night. They have very smelly, unpleasant odors and leave their droppings and urine anywhere. 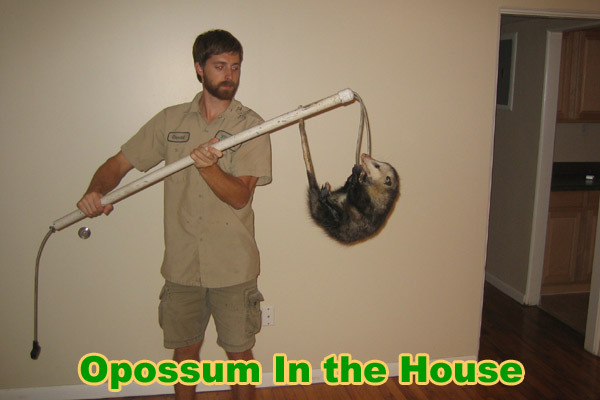 The house provides a good habitat for opossums especially in the attics walls and chimneys. These places are comfortable, warm and opossums can easily access food. You will mostly find female opossums and their young ones living in attics since it is safe and offer protection to the young ones. Being omnivorous, opossums feed on human food from left-overs in the garbage to pet food. They also feed on plants insects and any stored food they come across in the house. Although opossums may be a nuisance, consider the fact that they are nomadic; meaning they will move away on their own. They don’t usually take up residence for long and they do not have long life spans. They also have a gentle nature, for the most part, and this should be kept in mind when you are considering methods of getting rid of them from your property. Opossums like meat, and although they are scavengers and will eat most anything, they are highly attracted to meat sources. If you plan to use a cage trap for them, then meat is a good bait to lure them. Keep in mind that capturing one opossum will not necessarily solve your problem as there are probably babies hanging around. It would be ideal to have a large cage for the mama and several small cages (such as for rats and mice) for the babies. Be sure to check the traps often so that the creatures do not suffer once they have been captured. When you open the cage to let them out after you have relocated them, they may be too frightened to leave the cage at first. Give them some time, or you can try blowing at them to get them to move. Other methods like poisoning and using repellants are inhumane and are illegal in many states. Also the available repellants in stores do not work. Killing the animal may also bring a stench in your house and this might attract other pests. Experts have various trapping techniques that get rids off the opossums. The only job for you is to control and prevent opossums from your house. First, you have to know what is attracting the opossums in your house. Secure food sources such as sealing the garbage cans, dumpsters, bird feeders and pet food. Other measures include installing special barriers like fences and regularly cleaning your attic, chimneys and other possible places the opossums can live. After the opossums have been removed, repair the damaged walls, pipes and sealing any entry or exists points the opossums used. Thoroughly clean the affected areas and make sure the stench goes away.